Want to be more effective at work, and have more fun at home? Just make friends with your brain. Get to know you brain a little better. Stop taking it for granted. And don’t put it under unnecessary pressure. This thinking is more realistic, and will help you to stay calm and focused. Don’t fall into the trap of imagining a worst-case scenario. Most of our problems are not terrible or awful. They are just annoying, disappointing, or inconvenient. Whenever you notice you’re getting tense or upset, take a deep breath and ask yourself, “What am I upset about, what am I thinking right now?” Write down what’s on your mind. We often upset ourselves by thinking things are much worse than they really are. Practice being mindful. Being mindful is about taking time to observe what we are thinking and doing without judging ourselves or others. It is about becoming familiar with, accepting, and appreciating things as they are. Treat your brain the way you’d treat a good friend. Make a Commitment to Your Brain – Try This! Experiment with some of these ideas over the next 30 days. Set a goal for how you want to improve the way you and your brain work together. Make notes on what you’ve achieved at the end of each day – what you’ve practiced and what you’ve learned. As with any new learning, you will take some steps forward, then one or two steps back before you move forward again. Keeping a record will help you reflect on what worked well and what was difficult. Work with your mind to grow more familiar and relaxed with your thinking. • Prioritize your tasks for the next day at the end of the previous day. • Leave emails and phone calls until later and start with your most important, challenging work. • Use graphics to display your thoughts and improve your concentration. • Work on one task at a time. Your brain will be happier if you don’t multi-task. • Reconsider and dispute upsetting thoughts. Observe your brain working, moment by moment – how thoughts arise, dwell, and dissolve – simply becoming aware of your thinking. 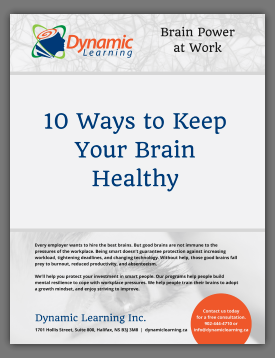 Once you feel more relaxed and friendly with your brain at work, choose something else to learn. You could learn techniques of problem-solving. You could develop your strengths as a leader. If you’re an accountant, you could become an expert in risk assessment; if you work in IT, you might develop a depth of knowledge in new web technologies; if you are a manager, you might want to learn everything you can about employee engagement. Studies have shown that continuous, challenging learning throughout our lives may reduce our risk of Alzheimer’s. If you can do this learning at work, so much the better. If you prefer to do this learning outside work, you’ve a world of choice. You could take singing lessons, or learn to dance, or play table tennis (one of the top sports recommended by brain experts because it requires fast coordination of eyes, hands and body without any danger of brain injury). You could learn a new language, learn to meditate, learn to swim better, or develop more skill in a favourite sport or hobby you had as a child. Give your brain a good workout every day by seeking a life of learning and challenge. Get to know your brain so well that you become best friends. You will have a happier, healthier and more rewarding life.